The VIX is declining but there are a couple of events that could spike it again. It normally takes 4-5 weeks for volatility to return to normal and we should have 1-2 weeks left. The market rallied on Monday on expectations for the Powell testimony on Tuesday to be dovish on interest rates and bullish on the economy. That would be the best of both worlds. However, this is his first public appearance since becoming Fed Chairman and he will have to be very careful in how he phrases his sentences and his replies to questions. In Janet Yellen's first testimony she developed foot in mouth disease and the market reacted negatively. Powell is a better public speaker and he has been around long enough that he should not get tripped up. He understands what the market wants and he does not want his first appearance to develop into a turnaround Tuesday for the markets. On the other hand, the House members will be looking for an opportunity to force him to say something that turns into a sound bite that will be played over and over again on CNBC for the next two weeks. That would be negative for the markets in the short-term. Longer term, as in the next 6-8 weeks, I do not expect anything to hold the markets back. With earnings for Q1 and the full year projected to grow by 18.0%, that is a powerful incentive to be invested in stocks. With $1-$2 trillion in cash being repatriated by S&P companies we can expect another round of stock buyback announcements and dividend hikes. With the economy growing steadily and accelerating nicely, all these components suggest stocks are going to be setting new highs soon. We just have to get past the headline volatility on Powell's testimony on Tuesday and Thursday. 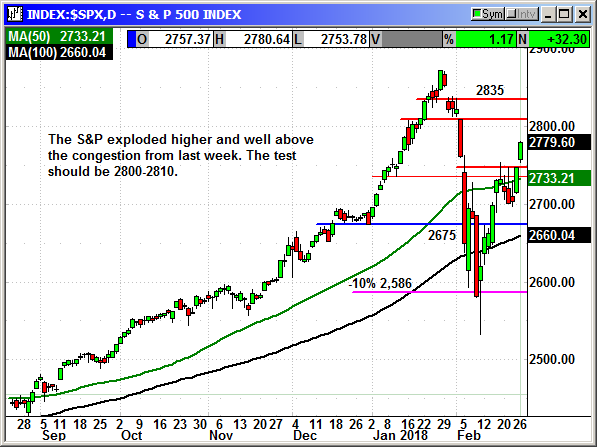 The S&P exploded higher on Monday to break free of the consolidation resistance at 2,750. This was an outstanding breakout and i would not expect to see that level broken again. It is always possible that it could be tested as support but it would take a major decline. Other than light resistance at 2800-2810 the next material resistance should be 2,835. 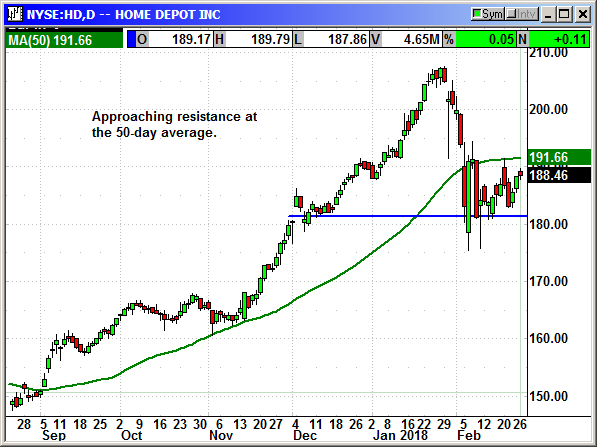 The Dow also broke out over congestive resistance with a 399-point gain. This was a strong move with only one Dow component posting a loss. 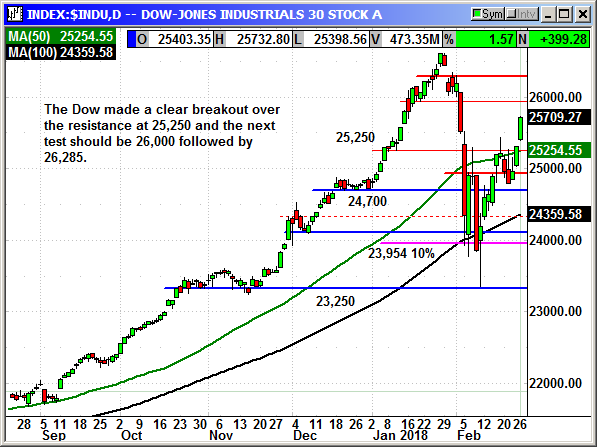 The Dow vaulted far enough above resistance that I would not expect that 25,250 level to be broken. We could always see a retest if Powell does a face plant on Tuesday but the odds are much stronger that we go higher than lower in the weeks ahead. 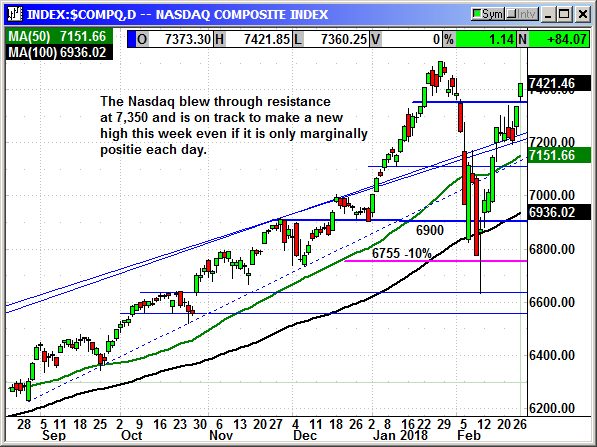 The Nasdaq punched through resistance at 7,350 and it on track to make a new high in the days ahead. The prior high of 7,505 is only 84 points above Monday's close. The big cap techs have caught fire again with Amazon leading the pack with a gain of another 22 points and close at $1,522 and a new record high. Netflix and Amazon have accounted for 40% of the Nasdaq 100 gains in 2018. 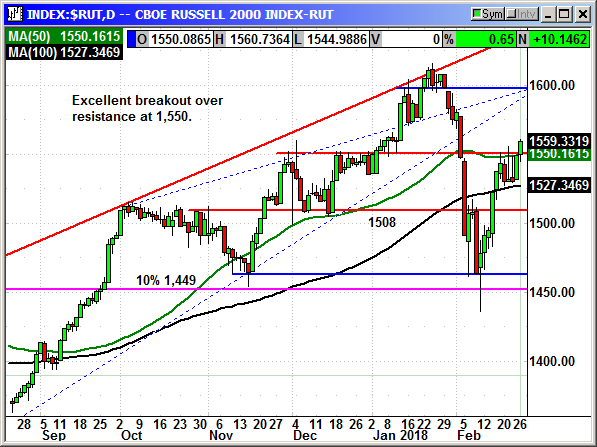 The Russell was the percentage laggard on Monday but still broke through strong resistance at 1,550. It should have a clear run to 1,600 if the big caps are positive but Powell's comments will have a bigger impact on small cap stocks because they are most at risk from higher interest rates. This is retail week for earnings with Etsy, Macy's, Elf, L Brands, Lowe's, TJX Cos, Kohl's, Nordstrom's, Gap Inc, Best Buy, Foot Locker and JC Penny leading the list. Priceline, Lowe's, Salesforce.com and VMWare are the high profile reports for the week. 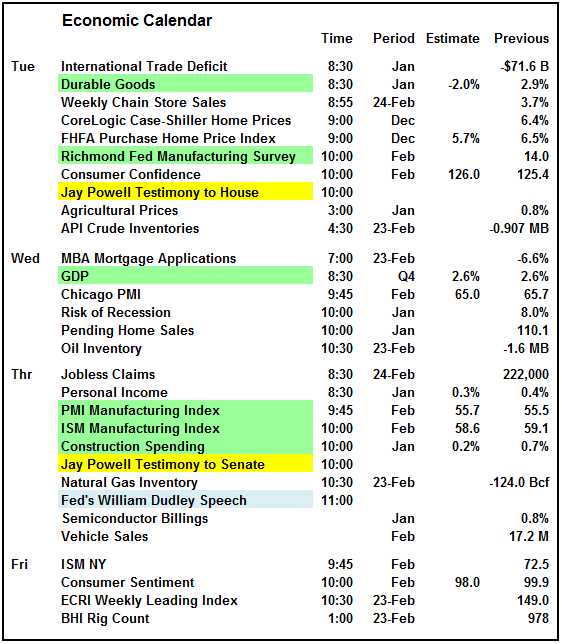 We have a busy calendar for next week with the Richmond Fed Survey, ISM Manufacturing Index and two chances for the new Fed Chairman to stick his foot in his mouth. I believe the worst is behind us and we are looking at new highs in the weeks ahead. I predicted back in January that we would see weakness by February expiration, a rebound to new highs in March and then another period of weakness after the Q1 earnings cycle has run its course. That would be in late April, early May and could last for several weeks. I do not expect extreme volatility but just a normal consolidation cycle before a rebound into the Q2 earnings in late July. Typically, the summer months are the weakest period for the market but as long as the earnings outlook remains strong, I see no reason to fear a dip. I would expect it to be another buying opportunity. 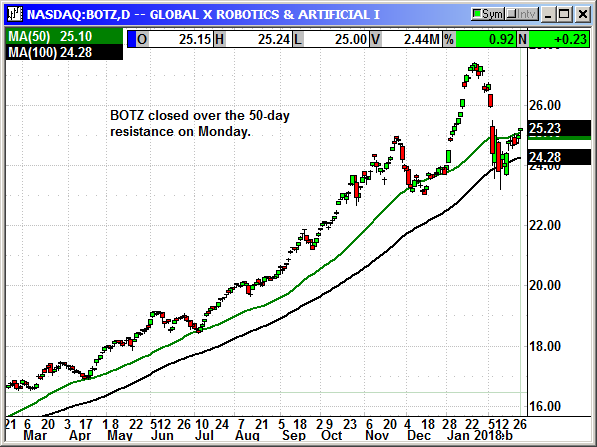 The Global X Robotics & Artificial Intelligence ETF seeks to invest in companies that potentially stand to benefit from increased adoption and utilization of robotics and artificial intelligence (AI), including those involved with industrial robotics and automation, non-industrial robots, and autonomous vehicles. The ETF seeks to provide investment results that correspond generally to the price and yield performance, before fees and expenses, of the Indxx Global Robotics & Artificial Intelligence Thematic Index. The ETF has 28 stocks including NVDA, ISRG, TRMB, BRKS, IRBT, MZOR, Toshiba and Cyberdyne. The ETF is somewhat slow moving since it just began trading in September. Volume has increased significantly to average 2.55 million shares. The key to this ETF and this position is that the stock rarely goes down and the options are cheap. There have only been 3 periods of decline in 2017 and each drop was only about 60 cents. The ETF rose steadily since April and hit a new high in January just before the market correction. If this continues, even allowing for some declines, that would equate to a nice gain by the end of the Q1 earnings cycle and that would be our exit target. This is not going to set the world on fire like a Facebook or Netflix but it should be dependable, stable gains. Obviously, past performance is no guarantee of future results. Buy June $26 call, currently $1.30. stop loss $23.75. CAT is currently a position in the Option Investor and LEAPS Trader newsletters with different time frames. I am adding it here because it is a monster and refuses to decline. 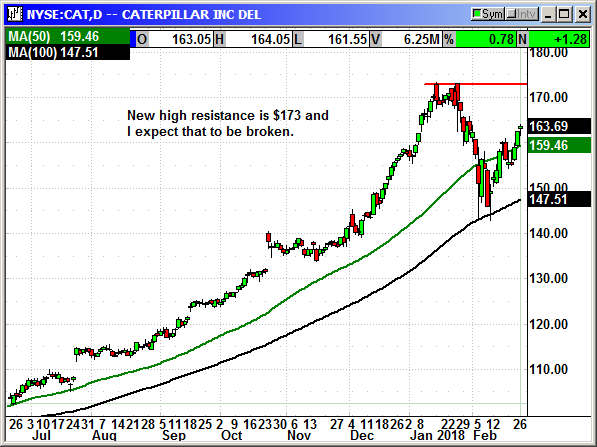 The infrastructure discussion in Washington and the global expansion makes this the right time to buy CAT. Caterpillar Inc. manufactures and sells construction and mining equipment, diesel and natural gas engines, industrial gas turbines, and diesel-electric locomotives for heavy and general construction, rental, quarry, aggregate, mining, waste, material handling, oil and gas, power generation, marine, rail, and industrial markets. Its Construction Industries segment offers backhoe, compact, track-type, small and medium wheel, knuckleboom, and skid steer loaders; small and medium track-type, and site prep tractors; mini, wheel, forestry, small, medium, and large track excavators; and motorgraders, pipelayers, telehandlers, cold planers, asphalt pavers, compactors, road reclaimers, and wheel and track skidders and feller bunchers. The company's Resource Industries segment provides electric rope and hydraulic shovel, landfill and soil compactor, dragline, large wheel loader, machinery component, track and rotary drill, electronics and control system, work tool, hard rock vehicle and continuous mining system, scoop and hauler, wheel tractor scraper, large track-type tractor, and wheel dozer products; longwall, highwall, and continuous miners; and mining, off-highway, and articulated trucks. Its Energy & Transportation segment offers reciprocating engine powered generator set and engine, integrated system, turbine, centrifugal gas compressor, diesel-electric locomotive and component, and other rail-related products and services. The company's Financial Products segment offers finance for Caterpillar equipment, machinery, and engines, as well as dealers; property, casualty, life, accident, and health insurance; and insurance brokerage services, as well as purchases short-term trade receivables. Its All Other operating segments provides parts distribution and digital investments services. The company was formerly known as Caterpillar Tractor Co. and changed its name to Caterpillar Inc. in 1986. The company was founded in 1925 and is headquartered in Peoria, Illinois. Company description from FinViz.com. CAT reported their rolling 3-month sales rose 34% globally. There was a 23% rise in North America. Resource segment sales rose 49%, construction sales +30%, rnergy and transportation rose 16%, power generation +8%, industrial sales +13% and oil and gas sales +27%. This company is in the sweet spot of the global economic boom. They report the rolling 3-month average to smooth out the big ticket sales spikes from month to month. I have had several people email me lately asking why I do not recommend short puts to offset the cost of long calls on stocks with good relative strength. I believe that is a great strategy but got away from recommending it over the last couple years because a lot of readers have smaller accounts and do not have the margin availability. I am going to start recommending it again as an option. Those who want to use it can but it is not a requirement for the position. Buy June $170 call, currently $6.50, initial stop loss $154.50. Alternate position: Sell short June $145 put, currently $3.05, initial stop loss $154.50. 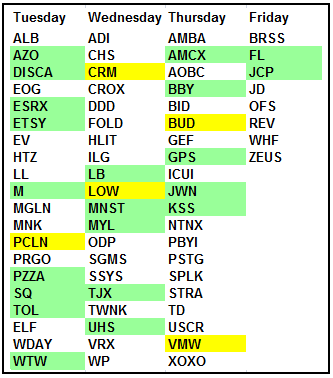 Check the graphic below for any new stop losses in bright yellow. We need to always be prepared for an unexpected decline. Any items shaded in blue were previously closed. The long call position was entered on Tuesday. No specific news. AbbVie will participate in the Barclay's Global Healthcare Conference on Thuesday March 15th and will present at 8:AM Central time. Original Trade Description: February 6th. AbbVie Inc. discovers, develops, manufactures, and sells pharmaceutical products worldwide. The company offers HUMIRA, a biologic therapy administered as a subcutaneous injection to treat autoimmune diseases; IMBRUVICA, an oral therapy for the treatment of patients with chronic lymphocytic leukemia; and VIEKIRA PAK, an interferon-free therapy, with or without ribavirin, for the treatment of adults with genotype 1 chronic hepatitis C. It also provides Kaletra, an anti- human immunodeficiency virus(HIV)-1 medicine used with other anti-HIV-1 medications as a treatment that maintains viral suppression in HIV-1 patients; Norvir, a protease inhibitor indicated in combination with other antiretroviral agents to treat HIV-1; and Synagis to prevent RSV infection at-risk infants. In addition, the company offers AndroGel, a testosterone replacement therapy for males diagnosed with symptomatic low testosterone; Creon, a pancreatic enzyme therapy for exocrine pancreatic insufficiency; Synthroid to treat hypothyroidism; and Lupron, a product for the palliative treatment of prostate cancer, endometriosis, and central precocious puberty, as well as for the treatment of patients with anemia. Further, it provides Duopa and Duodopa, a levodopa-carbidopa intestinal gel to treat Parkinson's disease; Sevoflurane, an anesthesia product for human use; and ZINBRYTA, a subcutaneous treatment for relapsing forms of multiple sclerosis. The company sells its products to wholesalers, distributors, government agencies, health care facilities, specialty pharmacies, and independent retailers from its distribution centers and public warehouses. AbbVie Inc. has collaboration agreements with C2N Diagnostics; Calico Life Sciences LLC; Infinity Pharmaceuticals, Inc.; M2Gen; and Principia Biopharma Inc. Company description from FinViz.com. 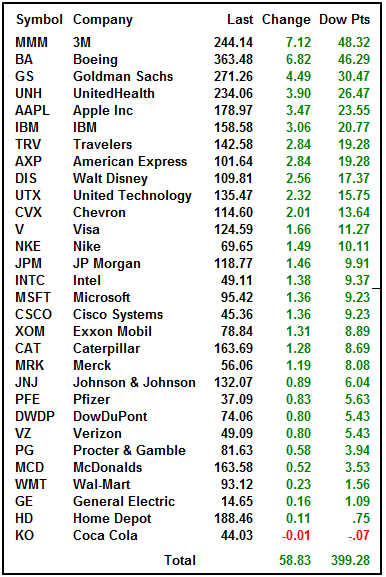 Next expected earnings April 27th. A lot of companies have 1-2 real drugs in the pipeline that may be approved. Several companies have one drug that could be a blockbuster and reach $1 billion in sales annually. AbbVie has multiple blockbusters in the pipeline and dozens of other drugs already in the market. Analysts claim AbbVie's pipeline is the strongest in the industry. The post earnings market drop is a buying opportunity. The company's other drugs are going to be cash cows. Imbruvica generated $1.8 billion in sales in 2016 and could reach $7 billion annually over the next couple of years. Venclexta was approved in 2016 for leukemia and sales could peak at $3.5 billion a year. An experimental cancer drug called Rova-T could hit $5 billion a year when approved. A psoriasis drug called risankizumab could produce $4 billion a year and arthritis drug upadacitinib could peak at $3.5 billion. AbbVie was a spinoff from Abbott Laboratories in 2012 and they are doing great. ABBV reported Q4 earnings of $1.48 that beat estimates for $1.45. Revenue of $7.74 billion beat estimates for $7.51 billion. The company guided for 2018 adjusted earnings of $7.33-$7.43, up from $6.37-$6.57 and analysts were expecting $6.66. The blowout guidance spiked the shares to $125 from $108. 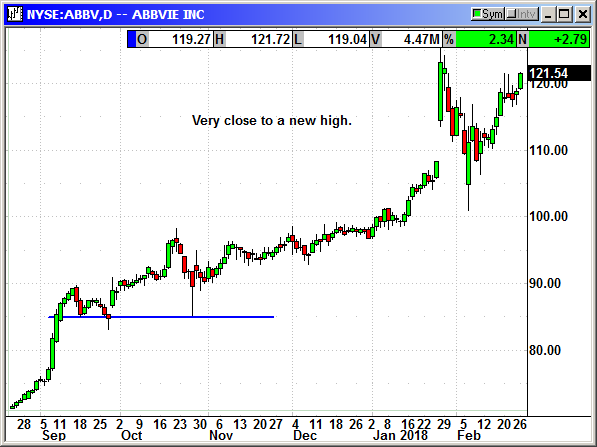 We had closed our prior ABBV position the day before the earnings. With the market crash, shares have now declined to $109 and giving us a chance to reenter the position. Update 2/10/18: AbbVie raised its dividend by 35% to 96 cents and announced a $10 billion stock buyback program. Long May $115 call @ $3.70, see portfolio graphic for stop loss. HD reported earnings of $1.69 that beat estimates for $1.61. Revenue rose 7.5% to $23.88 billion and beat estimates for $23.66 billion. Same store sales rose 7.5% and beat estimates for 6.5%. Customer transactions rose 2% with the average check rising 5.5%. Business is good! They guided for the full year for earnings of $9.31 but below estimates for $9.73. Earnings will be impacted by a 19 cent hit from the tax reform. The company is planning on investing a lot in new infrastructure and store remodeling and that will weigh on the full year numbers. Analysts will adjust and investors will return. There was a post earnings decline but shares are starting to recover. Original Trade Description: February 12th. The Home Depot, Inc. operates as a home improvement retailer. It operates The Home Depot stores that sell various building materials, home improvement products, and lawn and garden products, as well as provide installation, home maintenance, and professional service programs to do-it-yourself, do-it-for-me (DIFM), and professional customers. The company offers installation programs that include flooring, cabinets, countertops, water heaters, and sheds; and professional installation in various categories sold through its in-home sales programs, such as roofing, siding, windows, cabinet refacing, furnaces, and central air systems, as well as acts as a contractor to provide installation services to its DIFM customers through third-party installers. It primarily serves homeowners; and professional renovators/remodelers, general contractors, handymen, property managers, building service contractors, and specialty tradesmen, such as installers. The company also sells its products through online. It operates through approximately 2,278 stores, including 1,977 in the United States, including the Commonwealth of Puerto Rico, and the territories of the U.S. Virgin Islands and Guam; 182 in Canada; and 119 in Mexico. The company reported Q3 earnings of $1.84 that rose 15% and beat estimates for $1.81. Revenue rose 8.1% to $25.026 billion, up from $23.154 billion. This beat estimates for $24.523 billion. Same store sales rose 7.9%. HD said the hurricanes added about $282 million in sales but also cost them about $51 million in store damages and inventory shifting costs. The company guided for Q4 revenue growth of 6.3% and same store sales of 6.5%. Those numbers were up from 5.3% and 5.6% in prior guidance. Earnings are expected to grow 14% to $7.36 for the full year, up from prior guidance of $7.29. Full year 2017 sales are expected to be $100.6 billion. They had $8 billion unspent on a $15 billion share repurchase program. In early December, Home Depot (HD) announced a new $15 billion buyback and raised guidance for annual sales between $114.6-$119.8 billion by the end of 2020. The new repurchase program replaced the existing $15 billion program. The company expects to buy back $8 billion in shares total in 2017 with $2.1 billion in Q4. Since 2002, Home Depot has bought back 1.3 billion shares worth $73 billion. Home Depot had an effective tax rate of 37% in Q3. Under the new tax plan that would drop to about 23%. Analysts believe this could boost HD's 2018 earnings by as much as 25%. That means their earnings could rise as much as $1.81. They currently have a PE of 25 and that would equate to about a $45 rise in the stock price. However, I would expect that PE to decline somewhat in the conversion. Shares are already up after their November earnings guidance but I believe they can still go higher. Options are not cheap. In order to get the benefit of the rise in expectations I would like to reach out to May but the options are too expensive but not enough to make a spread worthwhile. I am recommending a March position and hopefully analyst projections will do the work for us. Earnings are Feb 20th and I would plan to hold over that report because they will give tax guidance at that time. HD is reportedly talking to XPO Logistics about an acquisition of the $9 billion company. HD uses them to deliver large items like refrigerators and other appliances. There could be a battle with Amazon since that large item shipping is a problem for Amazon. Option premiums are high because of the correction and rebound. Shares were trading at $210 two weeks ago and now they are trading at $185. With earnings next week, they could be back at $200 or higher very quickly. 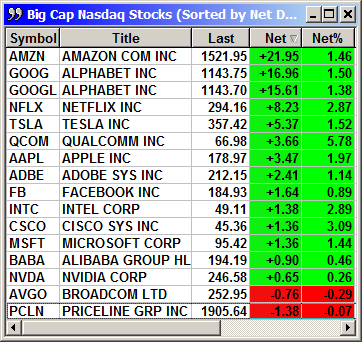 Long April $190 call @ $5.30, see portfolio graphic for stop loss. No specific news. 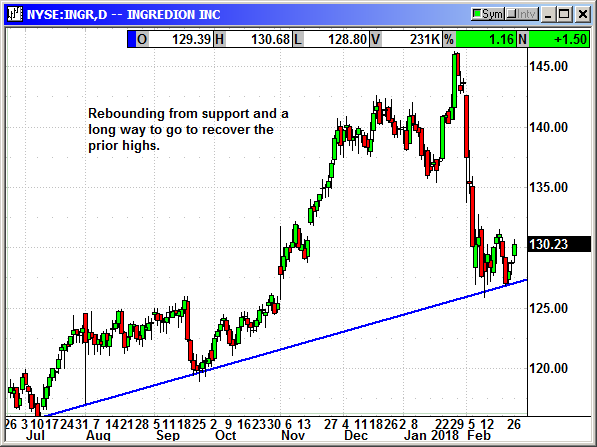 INGR rebounded from support but it has a long way to go. Ingredion Incorporated, together with its subsidiaries, produces and sells starches and sweeteners for various industries. The company operates through four segments: North America, South America, Asia Pacific and Europe, and Middle East and Africa. It offers sweetener products comprising glucose syrups, high maltose syrups, high fructose corn syrups, caramel colors, dextrose, polyols, maltodextrins and glucose, and syrup solids, as well as food-grade and industrial starches, and biomaterials. The company also provides animal feed products; edible corn oil; refined corn oil to packers of cooking oil and to producers of margarine, salad dressings, shortening, mayonnaise, and other foods; and corn gluten feed used as protein feed for chickens, pet food, and aquaculture. Its products are derived primarily from processing corn and other starch-based materials, such as tapioca, potato, and rice. The company serves food, beverage, paper and corrugating products, brewing, pharmaceutical, textile, and personal care industries, as well as animal feed and corn oil markets. The company was formerly known as Corn Products International, Inc. and changed its name to Ingredion Incorporated in June 2012. Ingredion Incorporated was founded in 1906 and is headquartered in Westchester, Illinois. No specific news. Shares dipped to initial support and finally rebounded on Monday. Several weeks ago Amazon bought Blink. You may not have heard about Blink but they launched in 2016 with an inexpensive wireless camera and video doorbell. This is the hot new sector for video surveillance. You have probably heard about Ring video doorbells, which is a different company. The point to this commentary is that Netgear is making the very popular Arlo security camera and sales are booming. Netgear also has 48% of the market for home routers. With Amazon likely to go big in this category after the acquisition of Blink, that means Netgear is suddenly a target. Global Equities said Facebook, Google or even Apple could acquire Netgear because that gives them a top position in the space. Google would be the prime candidate because they could link the Arlo system to Google Home. It would also allow Google access to trillions of terabytes of data related to the home routers and networking equipment. Monitoring those devices would be like keeping their finger on the pulse of technology. They would know how many people are watching Netflix, how much data was being consumed by what subset of users, etc. This could be very important in their planning for the future. Apple is not likely to make a play for Netgear because they do not do big acquisitions and Netgear has too many "common" products for Apple to manage. They would be more likely to buy Tesla or Netflix if they were going to make a big splash. Arlo is an entirely new category for Netgear and a category that is exploding in sales. In their Q4 earnings they said the Arlo cameras posted record sales that exceeded their already optimistic expectations. Since I wrote that in the initial play description Netgear has announced a spinoff of the Arlo security cameras. They will spin less than 20% and retain the rest. 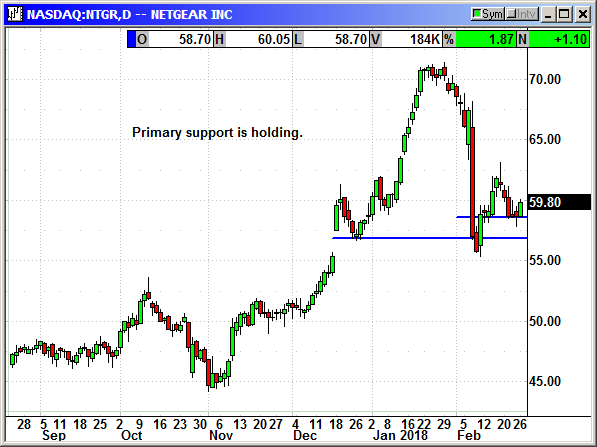 The cameras are so popular the IPO should be a big success and a good way for Netgear to monetize their investment. This will provide them a significant amount of capital to expand on their other product lines. In reality, nobody has to buy Netgear for them to succeed. Netgear demonstrated new products at the CES show and the crowd loved them. Apparently, so did investors. They announced the Nighthawk Pro Gaming system of network gear that will cut lag time and enhance multiplayer game play for serious gamers. They also demonstrated the Orbi Wi-Fi system, which has also been very successful. With the rapid ramp of the Arlo video cameras for security, they have completed an entire cloud support system that allows storage of video, multiviewer capability for home monitoring, etc. They reported Q4 earnings of 71 cents on revenue of $397.1 million,, up 7.9%. They guided for the current quarter for revenue of $330-$345 million. Analysts were expecting $348.2 million. However, Netgear has beaten estimates for six consecutive quarters so they may have been guiding lower so they can beat again. The combination of the light guidance and the market declined knocked $15 off the stock in February. Shares appear to have bottomed at $56 and have risen for the past two days. This is proving a buying opportunity on a previously strong stock. Long June $65 call @ $3.26, see portfolio graphic for stop loss. Volatility has declined significantly but it is not over. It normally takes 4-5 weeks for volatility to return to normal after a high volatility event and we could have a couple weeks left. The VIX only declined .69 today despite the Dow spiking 400 points. Investors are still worried about a second dip. The recent volatility 110% spike in the VXX is a once in a decade event. Without a nuke going off somewhere in the US, the odds are very remote of seeing the ETF over 50 again this year. Original Trade Description: September 18th. The VXX is a short-term volatility ETF based on the VIX futures. As a futures product it has the rollover curse. Every time they roll to a new futures contract, they have to pay a premium and that lowers the price of the ETF. It is a flawed product with a perpetual decline built in from the monthly roll over in the futures contracts. As evidence of this flaw, they have now done five 1:4 reverse stock splits. The last five reverse splits occurred at $13.11 (11/2010), $8.77 (10/2012), $12.84 (11/2013), $9.52 (8/8/16), $12.77 (8/22/17). The prospectus says it can reverse split anytime it trades under $25 for a prolonged period and the splits will always be 1:4. 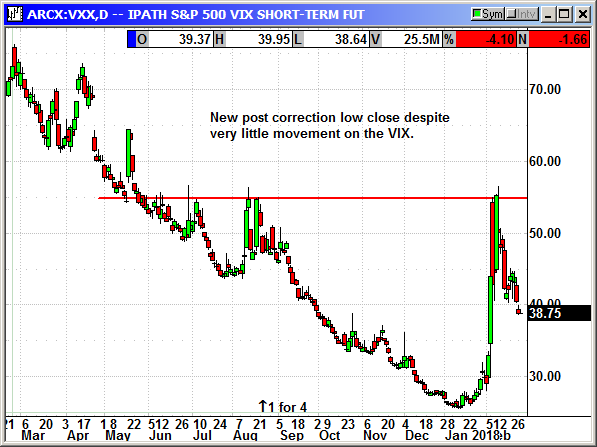 We know from experience that the VXX always declines. Unfortunately, put options are expensive with a volatility instrument at this price level. The only recommendation is to short the ETF and forget it. If we do get a new rally into the Q1 earnings cycle we could see a sharp decline in the VXX over the next 2-3 months. This will be a long-term position. This is not a 2-3 week play. I can guarantee you, if history holds, we can play this until it splits 1:4 again at $10. Once we are in the position and profitable I will put a trailing stop loss on it. We will take profits and then look for a bounce to get back in. The VXX is hard to short. There are 34.2 million shares outstanding and ShortSqueeze.com says 44.5 million are short. The shares are out there and being traded because the volume on Monday was 46.5 million. More than 221 million traded on Feb 5th. This ETF is a favorite vehicle for the computer traders so the volume is always high. You have to tell your broker you really want to short it and make them find the shares. Sometimes it takes days or even a week before your broker will find you the shares. Trust me, be persistent and it will be worth the effort. Previously: On Feb-5th a reader emailed me saying a friend was short 1,000 shares. When the VXX spiked $21 in afterhours, Ameritrade closed that position for a $35,000 loss. They did not have a protective stop loss. We are not using a profit stop in this position because it could be hard to re-short the shares after a volatility event. That is just trade management for a profitable position. In ANY SHORT POSITION, you should have a catastrophe stop loss to avoid the position turning into a major loss. Had this person had a stop loss at their entry point, they would have been closed for a breakeven and they would be sleeping a lot better today. Readers should always assume the potential for the worst possible outcome of a short position. Trade smart! Short VXX shares @ $49.16, no initial stop loss. At Option Investor, we have a long-standing policy prohibiting the editors and staff from actually trading the individual recommendations in order to conform to SEC rules concerning trades. The prices quoted in the newsletter are the end of day prices in most cases. When discussing fills or stops the prices quoted are the bid/ask at the time the entry trigger or exit stop is hit. This is NOT a price that someone on staff actually got using a live order. For entry/exit points at the market open the prices quoted will be the opening print. The majority of the time readers are able to get a better fill than the opening print because of market maker bias at the open. For trades with an opening qualification the prices quoted will be the bid/ask at the time the qualification was met. All of these rules normally produce worse prices than an active trader would normally get. Because they are standardized there may be some cases where a price quoted was better than an actual fill. If you received a price that was dramatically different than what was quoted please let us know. Copyright 1997 - 2019 Option Investor, Inc.
Do not duplicate or redistribute in any form. All rights reserved.